Create a schedule as part of you productivity plan. And if you think you don’t have time for that, check these tips. You have to create a schedule to be able to follow up your productivity throughout the day. Yes, you must have a (realistic) to-do list too. Still, to set the best time to get things done, you need to check your schedule first. When you don’t create a schedule, you go with flow. Hand in a report to your manager. While you know very well what needs to be done, everything is in the air. Time passes fast and suddenly you realize “it is time”! But you’re in the middle of something else and the dilemma of having to choose stresses you. If it’s relative to work, you know the answer. But who hasn’t entered an important long meeting in a rush, forgetting papers or even without stopping by the restroom first? Grab some unhealthy snack instead of cooking a healthy meal. Stay awake for longer than you should. Since you don’t have anyone waiting for you and you can always come up with a good excuse, you just do it. It’s true that no one is coming after you to pull your ears, but these aren’t the best options for you in the long run. If you don’t want it to keep on happening, you got to find time to create a schedule today. 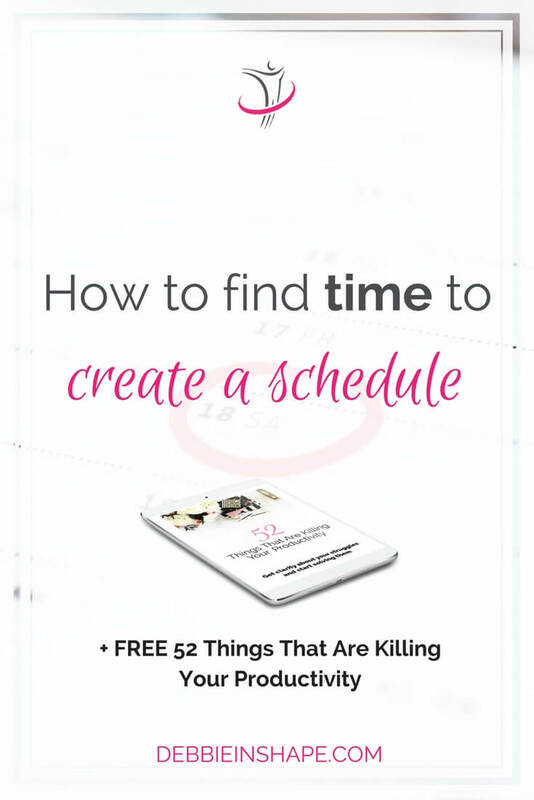 Creating a schedule will indeed require time from you. In the beginning, when you still need to build the habit and set your priorities, it’ll take you even longer. But this isn’t reason for you to lose heart and give up. On the contrary, it’ll only get better if you start creating a schedule. Little by little, you’ll get accustomed to separating time to plan. Feel motivated to keep it up. By giving, however, your days will continue to be chaotic. Nothing will change and you’ll still feel tired, stressed, overwhelmed and unaccomplished. Give yourself time to get accustomed to creating a schedule. Don’t set a due date for your effort, though. While some people may already feel comfortable after a couple of weeks, the same process might take months to someone else. No matter how long it takes you to feel comfortable to create a schedule, it’s still worth it. If you fall short sometimes, just pick it up from where you started. There’s no reason to feel guilty or stress about it. Let it go and move on. To be sincere, it’s more a matter of making the time than finding it. You’ll need to rearrange your planning. Make sure you have at least 30 minutes to create a schedule in the beginning. It isn’t going to stay this way. As you progress and develop a process, you’ll be able to complete your weekly schedule in 15 minutes or less. If you’re too overwhelmed at the moment to even think about about blocking so much time in your calendar just for planning, I highly recommend you downloading my list 52 Things That Are Killing Your Productivity . This list contains time-wasters that might not be so obvious to you. Yet, chances are preventing you from finding time for things that really matter. At the end of the list, I added questions to help you gain clarity about your own productivity killers. By answering them you can start work on them. 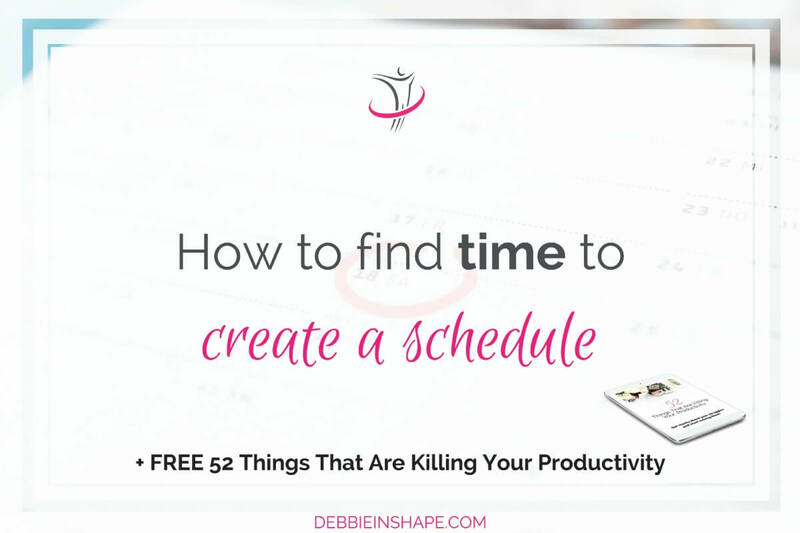 I also want to invite you to join my Facebook Group #PlanWithDebbie. There, you can share your struggles and brain storm about them. Find time to create a schedule by working on your time-wasters. You should also start tracking your daily activities to have more visibility of your schedule. In times when we’re always connected, you’ll be surprised by the amount of time spent (read, wasted) with non-productivity tasks. I understand that if you’re a blog or a solopreneur, social media plays a major role in your business. If you’re a professional, you may also want to stay in touch with the influencers of your field to learn the latest from your industry. There’s nothing wrong with social media, but the way you use it might be harming your productivity. 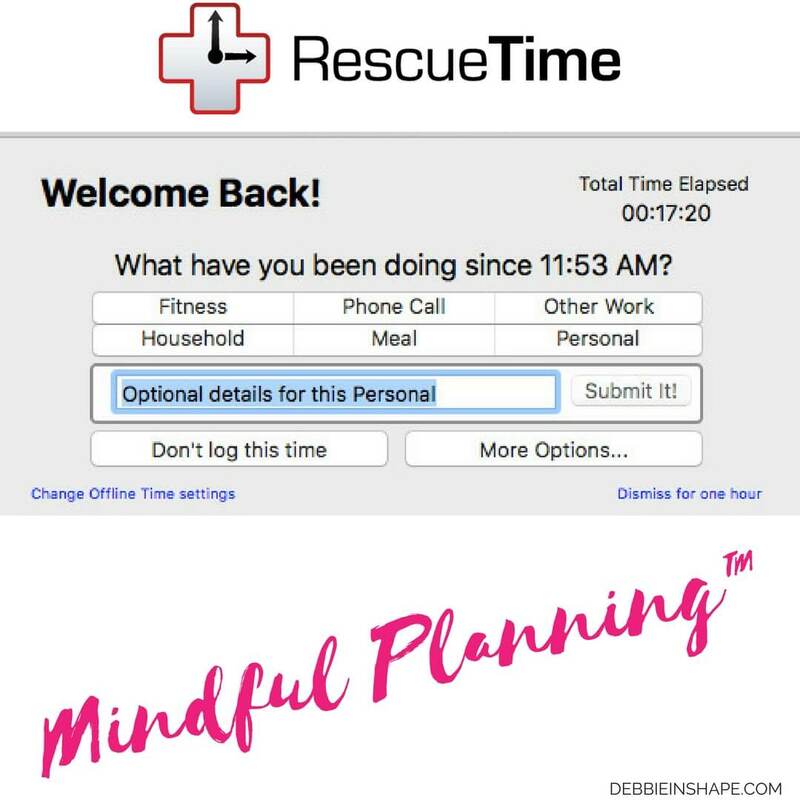 Try an experiment, install a tool like RescueTime on your computer and check your social media time at the end of the day. If you opt for their Premium plan, my personal favorite, you can also track time away from the computer. What it does is prompting a screen in which you can input what you have done while you were away from the computer. You pick the name of your main categories and add a specific description of your activity. I separate my social media time away from my computer into “Other Work” or “Personal”. The first one is productive time (interaction with my followers, posting for the IBA, etc). The second, not productive (checking my feeds for the fun). At the end of the week, I have a good idea of how well (or not) I spent my time. This gives me a realistic insight of my productivity and helps me create a schedule for the next week. Don’t take time-tracking for granted. It’s the best way you can find time to create a schedule and to do the things you love. Start by making a weekly schedule. Create a dump list, I love Evernote for that, and use it as your reference when creating a schedule. Make sure you stick to your schedule to be success with your planning efforts. 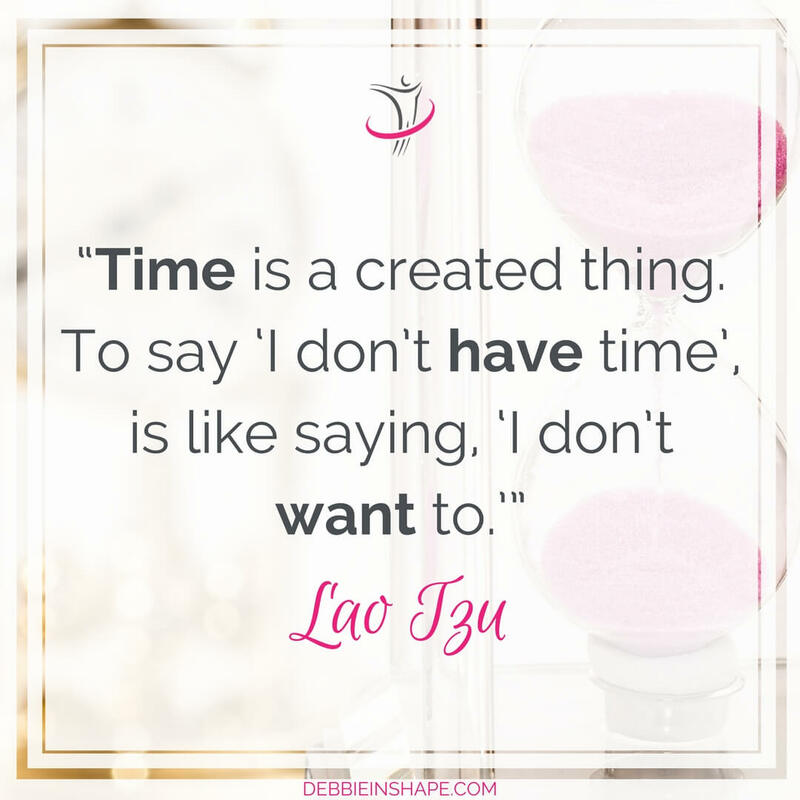 And if you need help with finding time to create a schedule, don’t hesitate to stop by #PlanWithDebbie and ask your questions.